We’re Chesapeake Bay oyster farmers. That means we’re hard-working, God-fearing, cage-lugging, early-rising, fun-loving, big-dreaming, family-honoring men who would give you the shirts off our backs. Our oysters are cultured. Us? Not so much. Never have had too many requests for the shirts off our backs. They usually don’t smell so good at the end of the day. We’re sure you’d be far happier to take home some of our oysters. Ted’s a native Marylander, married to the same wonderful north country girl for over 20 years. Oysters aside, their 3 children are the coolest crop they’ve been raising. Aidan, serving his country in the US Coast Guard. Erin, swinging the world by the tail in college out in Phoenix, AZ and Maeve, preparing to storm the gates and head out into the world all too soon. That’s today but where has he been? Ted hitch hiked about 25,000 miles during his college years. Twice to California and back. Once across Canada to Alaska and a fist full of trips up and down the east coast between Maine and Florida. By the tail end of those wanderings he had earned a BS in Biology from the University of Maine. After school, still not ready to settle down Ted joined the Peace Corps and spent over 2 years doing aquaculture work in equatorial Africa. He celebrated the end of his time there by paddling a dugout canoe with some pals hundreds of miles down the Sankuru to the Kasai and finally into the Congo River. Following the frying pan of equatorial Africa it only made sense to cool off in Alaska for a couple years. Home was a tiny log cabin near the coast. Work was the back deck of a variety of commercial fishing vessels from long liners to crab boats with a sprinkling of drift netting for good measure. Those years included two seasons out of Dutch Harbor on King crab boats where it became evident that life might last longer if he learned how to build boats and let some other fool spend time on the back deck. So then it was off to England to spend a year learning the wooden boat building trade. Okay it takes more than a year to do that but it was a good start anyway. 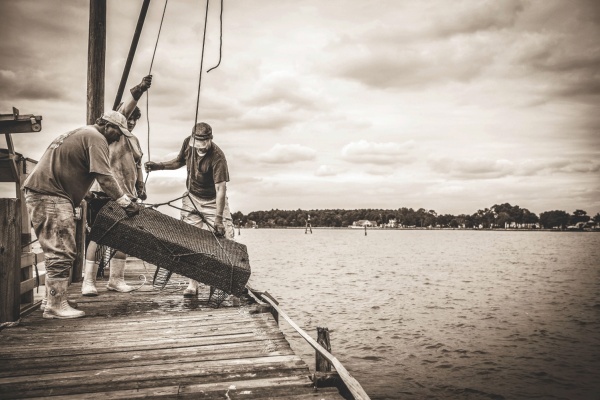 Then back home to work for 8 years as a boat carpenter on the Eastern Shore of the Chesapeake. For 20 years Ted piloted a desk as a partner in a Healthcare Financial Services Company, raising a family and doing that stable thing. Then that feeling of being like the Maytag repairman (remember those commercials?) overtook him and Madhouse was born. Midlife crisis? Maybe. Good oysters? DEFFINITELY. As a fourth generation oysterman, for Scott, Sr., working with oysters isn’t a job; it’s a way of life. Scott is what’s known to the locals as an “over-the-river-un.” That means he grew up right across the river from Hooper’s Island, where Madhouse was founded. He started oystering when he was five. After graduating from Cambridge South Dorchester High School, Scott earned his "oystering degree" out in the bay. He likes to call it Chesapeake University—and it’s an education like no other. Scott met his best friend-who also happens to be his wife-on a blind date over 25 years ago. Their three kids grew up on the Chesapeake—just like Scott did. During his decades on the water Scott has dredged and hand tonged, fished and crabbed in all manner of weather with each day starting hours before sunrise. His father always told him, “A real waterman is out there every fittin day”. Whether the day is fittin or not, this man is out the door in the dark and come rain or shine he will find a way to wrestle with Mother Nature to earn his bread. When the work day is done, you’ll find him with family, sharing a meal or playing with his grandson Scott III. Scott, Jr. comes from a long line of Robinsons who made their living on the bay. He’s proud of that legacy. Scott, Jr. graduated in the top 50 of his class at Cambridge South Dorchester High School and later attended Wyotech for Collision Repair, graduating with a 3.5 GPA. Some of Scott’s best memories are of working the water with his dad. He started at a very young age since dad put his crib in the boat when he set out to work each day. As he grew, Scott learned about the family heritage while working on boats to earn extra spending money. It didn’t take long to realize that his heart, and his future, wasn’t in cars. It was out on the bay. Scott married his sweetheart Sarah back in 2014 and they have already gotten started on the 6th generation of Robinsons to work the water as Scott III was born in 2015. Copyright © 2013-2019 Madhouse Oysters. All Rights Reserved. 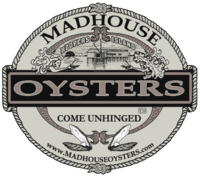 Interested in Madhouse Oysters? Give us a call (410) 310-4132 or fill out this form.